Renato Sorriso did indeed reveal the soul of Rio, but not the way veteran journalist Elio Gaspari, meant, in his March 8 column. Sorriso (Smile, his nickname), a trash collector, is famous for samba-ing down Marquês de Sapucaí Avenue during the annual Carnival parades, as he sweeps up after each samba school. The columnist’s first error was to believe local reporting. Photos of Rio’s famous trash collector, carried on his co-workers’ shoulders, led many people, including journalists, to suppose that he had joined the strike. During the work stoppage, however, Brazilian media seemed to have inexplicable difficulty in interviewing strikers. Apparently, only one publication took the initiative to see what Renato Sorriso actually had to say. He told the UOL site: “I’m totally in favor of each person going after his or her own objectives. But I’m punching the clock as usual. I worked during Carnival at the Sapucaí parades and I also swept some streets in Tijuca, as usual … I preferred not to strike”. Gaspari’s second error was to focus on an old phenomenon, instead of seeing a new one. Rio still is capable of becoming enchanted with characters from downstairs. But the issue at hand was not, as the columnist claimed, mayor Eduardo Paes’ difficulty in recognizing this phenomenon. Regardless, something new is afoot, that Gaspari himself was unable to see in the trash collectors’ strike: the downstairs characters –“represented” by Sorriso — are no longer satisfied with the enchantment of those who live upstairs. For centuries, Brazilian society has eased the tensions of inequality by way of enchantment with the “downstairs characters”, as Gaspari describes them. Carnival is itself the biggest example of this. The movie Neighboring Sounds provides a marvelous portrayal of the friendly relations between employers and employees that sustain the traditional structure. The mayor got it. He understood that the samba-ing trash collector (as well as the union that strikers said didn’t represent them) had become irrelevant. By negotiating directly with them, Paes caved hugely, raising the monthly wage floor from R$ 875 (US$ 372) to R$ 1,100 (US$ 467), quite close to the strikers’ demand of R$ 1,200 (US$ 510). When you come right down to it, happily applauding Renato Sorriso’s samba steps while he swept Marquês de Sapucaí Avenue was very little indeed, compared to the 37% raise his co-workers got by walking off the job during Carnival (and there was strangely little comment in the press on the 37%, possibly a historic number). Given the profound societal transformation which the trash strike indicates, the time has come for those “upstairs” to pay some attention to the compensatory festivities that are part of our daily lives here. Being enchanted with the downstairs characters — weaving and keeping friendly relations with those below, is today far less than is needed to sustain Brazil’s democracy in a peaceful manner. 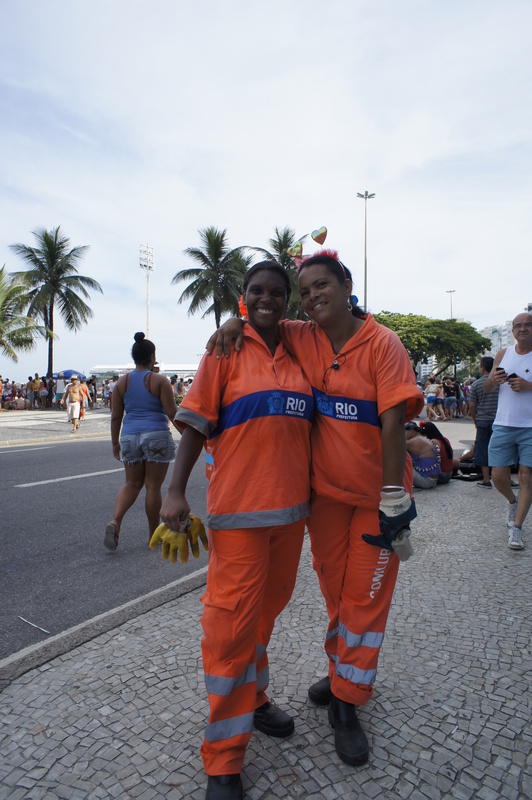 It wasn’t exactly Sorriso who uncloaked Rio’s soul, but the trash collectors who had the courage to reveal, for anyone who cared to look, that the city’s soul is in full transformation. It’s become acceptable to question the status quo, circumvent representative institutions, to carry out a “mutiny”, as the mayor initially described the movement. And this isn’t only about the darling trash collectors. A strike partially sidelining a union has been going on for more than 40 days in the interior of the state of Rio, by employees at the Comperj petrochemical complex. As time goes by, the real nature of the exchange between the upstairs and downstairs of Brazilian society will become ever more apparent. In Rio de Janeiro, we’ve certainly gotten a good whiff of it. Meanwhile, when are we going to set up full recycling? This entry was posted in Brazil, Transformation of Rio de Janeiro / Transformação do Rio de Janeiro and tagged Comperj strike, Eduardo Paes, Elio Gaspari, Renato Sorriso, Rio de Janeiro social change, Rio de Janeiro trash strike. Bookmark the permalink. The folks upstairs in Rio might well be enchanted with those downstairs — the tax system in Brazil favors the rich more than any other nation in a recent study reported in O Globo except for Saudi Arabia and Russia. Paying the downstairs help more can result in inflation but this could be counteracted by taking a little more from people who earn millions. It’s easier to smile when you are rich than it is to not frown when you are poor. You nailed it. Funny (not really) that someone as experienced as Elio Gaspari couldn’t catch a thing.